In my case, the DVT was severe (phlegmasia cerulea dolens). My entire left leg, through my pelvis, and nearly all the way to my heart was one enormous blood clot. 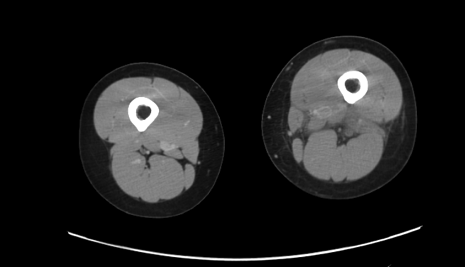 In half of the cases that are this serious, the patient either dies or loses the leg. I spent a total of 6 weeks in 4 hospitals around the globe, spent 3 weeks hooked up to an IV, and have had 7 surgeries (and counting). I could not walk and I was told that I would have to accept that I would never run long distances again. I say all this to those of you who have experienced a DVT. Your body is an incredible machine, and it can recover, even if your DVT is as severe as mine. After pushing my body to its limits—going to the gym regularly, engaging in strength training, and just running through the excruciating levels of pain—I can run again. I have run eleven half marathons and countless shorter races since my diagnosis and will continue to keep running. I also managed to run my first marathon, the November 2014 NYC marathon! Hey, have you ever looked into having that permanent clot in your vein removed. They have new procedures that can remove that clot and restore blood flow. You can do a Google search on DR. Garcia at Christina Care in New Jersey! He can go in and remove hardened clots, place a stent in the vein, and restore blood flow. Your story is very inspiring. I had my DVT two years ago. I went misdiagnosed for many months due to the fact that I thought I had a pulled muscle. As a result, I have inflammation in some of my veins and narrowing of the lumen. Although all of my chronic clots have cleared out, my leg is in extremely bad shape. If I walk for more than 30 minutes at a faster pace, I am limping and in pain for the rest of that day, and for several days after. I don’t know how you rehabbed your leg enough to be able to run again, but I commend you for doing so. Also, my clot was a string of clots all the way up to my pelvis. It took more than two years for them to clear out, but all of them eventually cleared out. Chances are your occluded vein has made substantial progress since your doctors told you it would be permanent. Did they test you for any genetic clotting factors? I’m guessing that since your clot was in your left leg and so extensive, that you might suffer from May Turner Syndrome? Any how, I hope you are continuing to improve. Please keep us posted on your recovery. I misspelled May Thurner Syndrome. Sorry about that. I also wanted to add that I was in bad shape when I finally went to the emergency room. I was literally dragging my leg across the floor like a dead piece of wood. 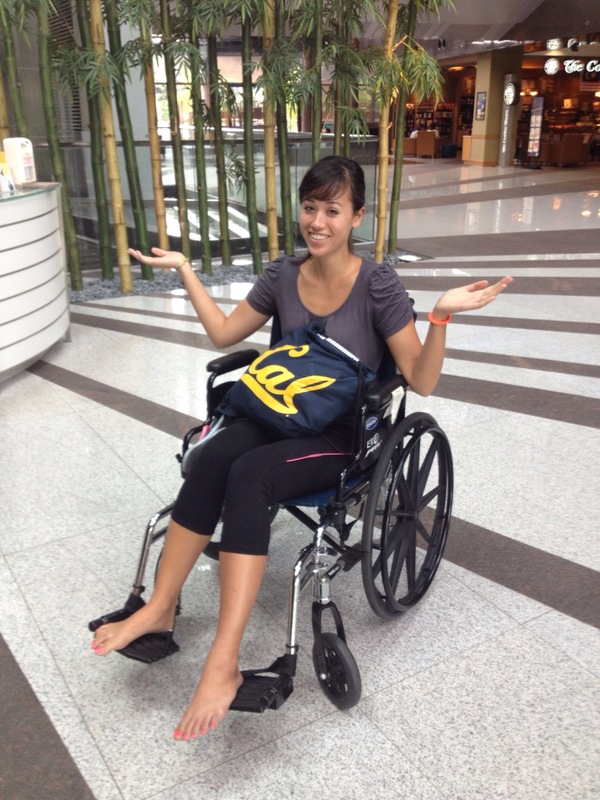 When I as released from the ICU, I literally couldn’t walk from the third floor of the hospital to the lobby on my own. I had to have a nurse twice my age wheel me out in a wheel chair. It made me feel so helpless and alone. I also had a large saddle PE. My lungs were not in that great a shape. But like you, I survived, and I’m grateful to be alive. I wish there was a better way to get the word out about DVT/PE. If I knew how serious a blood clot was, I would have never walked around for as long as I did under the false assumption that all I had was a sprained ankle. I think if I would have been treated sooner, and in a more aggressive manner, I would not be suffering from Post Thrombotic Syndrome. I have considered having the permanent clot in my vein removed. I actually live in New York, so I’ll look into Dr. Garcia and his procedures. I actually had total blockage in my pelvic (iliac) vein as well, and my doctor in California gave me a stent to help open the blood flow–that’s been a huge success, but the problem is that the vein in my thigh (femoral) is smaller and there is a concern that if a stent is put in, it could collapse and be stuck that way permanently. I had been told until your comment that it was impossible to remove the scar tissue because if you tried to burrow through, you ran the risk of irritating the injury even more and creating even more scar tissue. Am really interested in reading more about what makes Dr. Garcia’s treatment so innovative and different! I’m so sorry to hear about your leg. It sounds like you have some pretty severe post-thrombotic syndrome. From what I understand, a lot of this pain is caused by the fact that our valves are complete damaged and so there is no longer a good pumping system to help get the blood back up out of our leg (working against gravity). I definitely don’t want you to give up though! Honestly, when I started walking again I was in SO MUCH PAIN. But I just went to the gym every day and pushed through the pain. I was told I couldn’t do further damage to my leg/veins by being physically active, so I kept on going, even when it felt like my leg would just EXPLODE all over the treadmill. Over time, I think my body realized I’m completley crazy and compensated by making additional small veins (collateral veins) that are now able to make me run again. I’m also able to go without a compression stocking for much longer. Speaking of which….do you wear a compression stocking? It’s actually REALLY important in aiding our recovery. I get the highest grade of compression and wear a sock that goes all the way up to the top of my thigh. It squeezes my leg very tight so that the blood flow is encouraged out of my leg. I highly highly recommend you start wearing them ALL the time (except to shower and sleep, I even wear mine at the pool/beach). I don’t have May Thurner (they thought I might since the clot was my entire left leg). I actually have Factor V, was on birth control and slept on a long flight to Thailand (the perfect bad luck storm). And I’m so sorry to hear about your experience at the hospital–I can definitely relate. I was indoors and in a wheelchair for an entire month in a foreign country and it was perhaps one of the most depressing and really discouraging times of my life. I felt really grateful to be alive (I spent my 26th birthday in the hospital), but still not how I expected to spend my entire Fall. Even after I got back to America, it wasn’t for another couple months that I could even walk again…I would hobble around the apartment with crutches and all my friends had to visit me since I couldn’t even walk a block. My point is — not throwing myself a pity party — that even though it was completely horrible and miserable for us, WE CAN DO ANYTHING. I just know that you can get to where you want to be if you believe and know that we can beat DVT. I really recommend reading this blog. Roland features a monthly athlete, and each person’s story is truly inspiring. Every single person experienced a terrible DVT or PE and is up and running again. Hi, Amaris. What a well-told, inspiring success story. I had my own DVT/PE story shortly after my 50th birthday, and have worked hard to get back to walking, swimming, etc. I was pretty fit before the incident, and afterwards could barely walk 100 yards without feeling tired and winded. Little by little–now I can swim a mile, walk 5 or more, hike at altitude–it CAN be done, even if you are older when it happens. My doctor was surprised and pleased. My doctor said to wear compression stocking for 3 months, but I wore them for a full year. Thanks so much for the kind words! I’m sorry to hear that you had to go through a similar ordeal. It’s really great to hear that you’re not letting it hold you back though! I really think that working hard to get back in shape again is really the best way for us to live healthy, happy and pain free lives! 🙂 Hearing your story inspires me as well! Happy training and thank you for sharing your story!!! Hi Amaris,,you inspire us all,,wish you more success and progress,,I want to ask you about leg cramps ,,I have been diagnosed with DVT about a month ago I walk throdisabling,,i am begining to embrace pain but what about leg cramps ?they are disabling..have you experienced leg cramps and how you dealt with them? Hi Nessy, sorry about the delay in my reply. I just wanted to check in and see how you are doing now. Are you still dealing with cramps? HI Amaris! I am a competitive cyclist and have been diagnosed with my second DVT in 10 years. It is about 6 inches in length in my femoral vein. I have been on blood thinners for a month and I can walk but am eventually met with a good deal of pain. Even if the clot is not gone, is it safe to push through the pain and begin physical activity. It swells and changes color when I push it. Did you experience this? I feel like the medical professionals I have met with have little experience with a young, active person. They don’t want me to do much. Any advice is greatly appreciated! First, I’m so sorry to hear about your clot! I know it’s incredibly frustrating, especially when you have been active for so much of your life. I can’t imagine how you must feel having to go through this entire ordeal again. Do you know why you got a clot? I think it’s definitely important to talk to your doctor first before engaging in any kind of strenuous activity. What was safe for me and worked for me may not be medically okay for everyone and I don’t want to give you any bad advice! For my own situation, I similarly experienced a pretty severe clot — mine was from my ankle to nearly my heart, and unfortunately because I did not receive appropriately aggressive treatment, I was left with scar tissue in my thigh (femoral) vein, and also received a stent in my mid-section (iliac) vein. When I first became sick I was unable to walk and any kind of attempt to walk was met with a lot of pain. My leg would become incredibly swollen and would also change in color as well. I had been told by doctors that it would be unlikely that I would ever run again. However, after my current doctor treated me and enough weeks had passed such that my clot had become scar tissue and was no longer at risk of breaking off (and becoming a pulmonary embolism! ), my doctor told me it would be okay to push through the pain. The problem is because my arteries were intact, blood could freely flow into my leg, but because my veins were damaged and clogged, blood could not leave my leg. This was the source of my pain and swelling. For two years I helped combat this by wearing an incredibly tight medical grade thigh high stocking, which would help reduce the swelling. Despite it being incredibly painful, I would go to the gym regularly and exercise using the rowing machine, walking on the treadmill, and finally running on the treadmill. It was admittedly not fun and definitely hurt a lot, but because my doctor told me I was at no risk of further damaging my leg (PLEASE check with your own doctor first! ), I pushed through the pain, and eventually my leg compensated by creating new collateral veins. Now, whereas most people are able to really on their large deep vein, I have a web of new veins that allows me to work out and live an otherwise mostly normal life. I have also been on blood thinners since I got sick 3.5 years ago, and may likely have to be on them for the rest of my life, but have not faced any problems with working out and the thinners so far. Hopefully this helps, and definitely feel free to contact me if you have any further questions! Good luck!!! Thank you for sharing your story. It’s truly inspiring. I developed a clot from my ankle to my groin 2 weeks after having a baby. I also found out I have a clotting disorder. My question for you is did you notice any changes in the degree of swelling since you were able to start running again? Hi Melissa, sorry I missed your message earlier. I’m so sorry to hear about your clot, but congrats on your baby! I hope that in the last few months you’ve gotten better and that the swelling has gone down for you. I noticed a huge difference since I started to exercise again. The swelling is what made it really painful/difficult to mobilize, but over time my body was able to make new veins (collateral veins) to help improve with blood flow. I still have some swelling issues if I’m standing for too long since the valves in my leg were damaged, but for the most part as long as I’m moving around (running and walking manually pumps my blood where my valves can’t) it’s no longer noticeable! My name is Joana Mangune and I work for Health Monitor. We produce magazines, guides and more on several different health conditions. I’m currently working on our Deep Vein Thrombosis guide and am looking to interview people living with any type of DVT to find out how they cope with the condition. Our Guides are given out free in doctor’s offices across the country, so our hope is that they educate and inform people who are newly diagnosed, or help people who are struggling to manage a condition to find a treatment that works for them (whether it be through lifestyle changes, an all-natural fix or a medication). I’m looking to finishing this story by 1/25, so I would just need to hear back from you before then if you’re interested in helping us out! Really appreciate your help! Had my own dvt from left foot to my heart. 6 procedures and several surgeries as a result and even a brief moment I had died while in ICU. That was last July. I was mad they saved my life. My issues are far more critical than most and 1/4 of my body is titanium and 36 surgeries from an accident. After recently being tossed homeless from the love of my life and caregiver I stopped taking all my meds and had to travel 1,000 miles to find a new home I could stay. It’s back now after traveling, swelling and pain. This time I am doing nothing. This is my hope to finally leave this wretched awful disgusting earth. Heartbroken and lost I am done letting man intervene between me and God. This is it and hoping its soon. Goodbye Cruel wretched world. I cannot believe the one person I loved more than life itself could be so cruel and do what she did to me. She knew I would have no place but out of state and would lose my health coverage. By the time I could get new coverage in place I will already be dead from either my dvt or massive dilaudid withdrawl from my medtronics pain pump running empty. Goodby cruel world and yes Robin LaCasse Palmer left me all alone to die and she played she loved me until the very last day she sent me and my wheelchair out in the cold abyss to struggle each moment only to survive. Barely making it now two weeks. I pray to God my misery ends soon. Bring on my DVT and get it done. I am ready. Hi, I’m 20 years old and was diagnosed with dvt and beginning of PEs this past weekend. It has been insane, just about 8 months ago I did a medical check up and my health couldn’t be any better. The most scary thing is how something we have literally no control over is capable of almost killing you, I thought the pain was something like muscle spasm and didn’t really notice the swelling. I went to my primary care doctor thinking it wasn’t anything too serious but I was sent to the ER right away. It has been an emotional roller coaster and if it weren’t for the support I’m getting, I honestly wouldn’t know how to get through this. Finding more people who have had this (even though this was like 7 years ago lol) gives me hope and strength. My case isn’t as serious as yours, and I can’t imagine going through it away from home, so congrats I guess for winning this “battle” hahaha.